On January 29, 2013, the Casitas Municipal Water District board held a public meeting and the board voted to support a plan to buy out the Golden State Water Company's operations in Ojai. This action is the result of a local campaign to generate support for community control of the water supply. Currently Golden State Water, a for-profit company, charges the highest water rates in the area. On January 29, 2013, the Casitas board did exactly as we asked by voting unanimously to approve the goals to establish a Community Facilities District and to levy taxes (bonds) to buy the Golden State operations in Ojai. The board also approved a resolution to reimburse Casitas, from the bond, for all costs associated with the buyout so that NO CURRENT CASITAS RATEPAYER will have to pay anything for the buyout. The Casitas plan can be found on their website under Casitas Board Agendas for January 29th. Wednesday, March 13, 2013, 6 p.m. at Matilija auditorium. This will be the only opportunity for public input for or against the buyout. After hearing what the public has to say, the Casitas board will vote at the meeting on whether or not to go forward with the buyout of the Golden State Water operations in Ojai. Golden State is mounting a massive PR campaign to get others outside the area to attend and say they want the board to vote no. They did this at the January meeting with very little advance notice, so we expect the non-Ojai attendees to be out in force at the March meeting. It’s very important for you to show up and let your voice be heard, and please also tell your neighbors to speak out at this crucial March 13 meeting. Ojai FLOW is in the process of analyzing the Casitas buyout plan. So far, it looks very good, and our intention is to publish a position paper in the next couple of weeks. We’ll let you know as soon as it’s posted on our website. Thursday, March 7, 2013, 6 p.m. at the Ojai Valley Inn. At this meeting, you and all other Ojai Golden State ratepayers can learn about the Casitas plan and ask questions in advance of the Casitas meeting. We anticipate that the Casitas General Manager will be there, too. Please pass this newsletter on to your friends and neighbors, as this is the community’s best opportunity to understand why it’s so important to Vote Yes to buy Golden State. In the meantime, we encourage you to check out it our yourself as noted on our home page. The Ojai Valley News has written several very balanced front-page articles about Golden State Water Company and the buyout effort. If you’re not already a subscriber, we encourage you to subscribe to get the most timely information and to show your support for their coverage. The latest issue of the Ojai & Ventura View also has a lot of good information about the buyout. Visit our news tab often to see fresh news items and the latest letters to the editors. 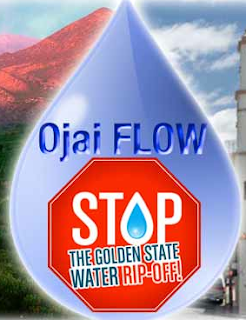 Keep your yard signs up, and pick up Vote Yes stickers to put on your mailbox door (it’s legal), your car window, your store window, the top right corner of your Ojai FLOW yard sign, or anywhere you feel it will show your support for the buyout of Golden State Water in Ojai. We will see you at the March 13th Casitas meeting!